The packed court room broke into applause after Judge Amanda Woodcock convicted Hong Kong woman Law-Wan-tung on 18 charges for inflicting grievous bodily harm with intent, assault and criminal intimidation of Erwiana Sulistyaningsih and Tutik Lestari Ningsih. “I am sure she (Erwiana) was telling the truth,” said Judge Woodcock as she read her findings the room full of journalists, activists, and friends. “I believe her testimony in its entirety,” citing credibility as a crucial issue in her findings. “When she left Hong Kong, she was a shadow of her former self,” said Judge Woodcock, citing Erwiana’s sunken eyes, swollen eyes and faces and wounds. Some of Erwiana’s injuries were caused by prolonged exposure to water and cleaning solutions, however over a dozen other injuries were not accounted for by this explanation. The attempt by the defence to pass Erwiana’s skin problems off as acne were “desperate and fanciful constructions,” said Woodcock. Judge Woodcock found that over eight months, Law repeatedly abused Erwiana, beating and punching her. In one incident, Law shoved a metal vacuum tube into Erwiana’s mouth and twisted it. On one charge in which Law punched Erwiana repeatedly in the mouth, the offense was changed from ‘inflicting grievous bodily harm’ to assault. Law was acquitted on two charges of criminal intimidation and assault on former employee Nurhasanah. Judge Woodcock told the court that given the long period and frequency over which the abuse occurred, it was reasonable that Erwiana and the other witnesses could not have been more specific on the dates and times. "Convoluted, cagey & desperate" – in ref to employer's child's testimony about why flat had CCTV cameras. Law repeatedly threatened Erwiana, and this is why she did not complain, leave or fight back. Judge Woodcock also agreed with Erwiana’s testimony that she was never paid wages nor given rest days. The testimony of the defence witnesses, said Judge Woodcock, “do not advance the defence case or are otherwise untrue.” Judge Woodcock pointed out that in several cases the testimonies of Law’s two children contradicted with facts that had already been accepted by the court. “I placed no weight on her evidence,” Woodcock said of the agent who had placed Nurhasanah and Tutik with Law, despite earlier complaints. Counsel for the defence Graham Harris requested he be allowed to submit character references. Judge Woodcock also requested that the defendant undergo psychological and psychiatric tests before sentencing. 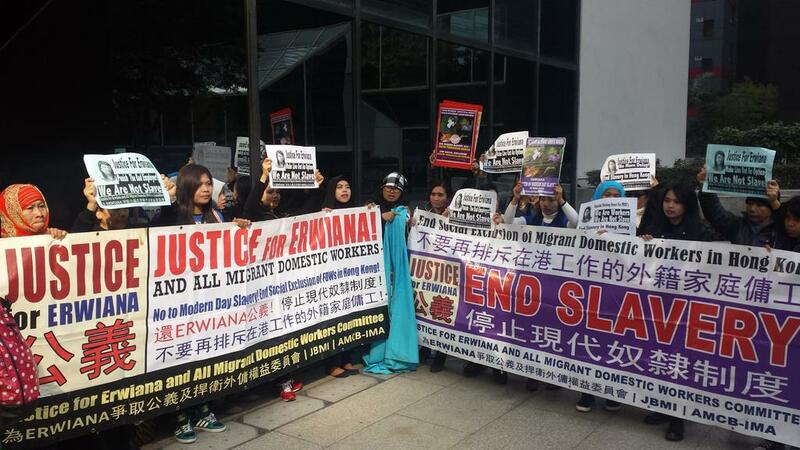 Outside the court room, representatives from the Justice for Erwiana Committee rallied to protest the abuse of domestic workers in Hong Kong. Law is remanded without bail until sentencing, and owes Erwiana over $28,000 in unpaid wages. Learn more about HK Helpers Campaign’s three campaign points and visit the Action Centre. This entry was posted in Blog HK Helpers Campaign News News: Politics and tagged blog HK Helpers Campaign news News: Politics on February 10, 2015 by Tom Grundy.